North Metro Storage respects the privacy rights of you, our visitors, our customers, or guests or anyone who visits the Website. We also recognize the importance of protecting information collected from you. This Policy applies only to the Website and not to websites maintained by other companies or organizations in which we do business with and/or link to. This Policy guides how we collect, store and use the information you provide online through the Websites. We request that you protect the confidentiality of any User ID and password you use to access any of your services online and/or the Website. You are responsible for all activity on the Website accessed by your User ID and password. Access by North Metro Storage’s employees or consultants to any personal information you provide is limited to only information necessary to provide the business service offered and to allow employees or consultants to perform their duties for North Metro Storage. To provide you with services offered on the Website, or to complete transactions or requests you initiate on the Website, we may transfer you to outside services provided by third-party operators. 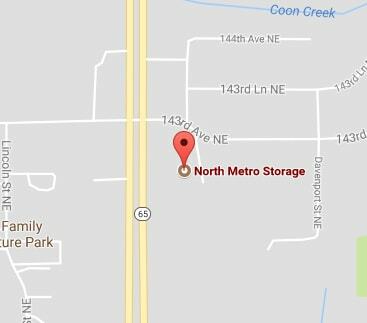 In certain instances, the third-party content may be “framed” in such a way that it appears that you are still on North Metro Storage’s Website. In such cases, we will have agreements with those third parties whose websites you may be transferred to, under which the third parties agree to maintain the confidentiality of your personal information and to use it only to help us serve you. If you use this site, you are responsible for maintaining the confidentiality of your account and password and for restricting access to your computer, and you agree to accept responsibility for all activities that occur under your account or password. North Metro Storage reserves the right to refuse service, terminate accounts, remove or edit content, or cancel orders in their sole discretion. We engage other companies and individuals to perform functions on our behalf. Examples include processing credit card payments and delivering packages. They have access to personal information needed to perform their functions, but may not use it for other purposes. We do not provide your personal information to third parties for telemarketing, e-mail or direct mail solicitation. When we contract with other companies to market or advertise products for North Metro Storage, we require that those companies also protect your personal information. We cooperate with government and law enforcement officials or private parties to enforce and comply with the law. We may disclose any information about you to government or law enforcement officials or private parties as we, in our sole discretion, believe necessary or appropriate to respond to claims, legal process (including subpoenas), to protect the property and rights of North Metro Storage or a third party, the safety of the public or any person, to prevent or stop any illegal, unethical, or legally actionable activity, or to comply with the law. North Metro Storage is permitted to revise this Policy at any time as it sees fit, and by using the Website you are expected to review such Policy on a regular basis to ensure you understand our efforts to ensure and protect your personal information that we may be privy to through your use of the Website.